I love crispy skin fish. It has to be done right – none of that flabby gross rubbery skin. I like the sort skin with that amazing c-r-u-n-c-h you bite, the kind that crackles when you cut it. It just adds such great texture and flavor to your fish dish. I have found the best way to achieve this crunchy texture is to wash and dry your fish really well. Get a pan hot with butter and oil (about 1 T. each). Season the fish both sides, and put the fish in skin side down. Baste the fish repeatedly, with a spoon on the flesh side. Allow the skin side to cook and crisp up. You will cook 95% of the fish on the skin side, crisping the skin, and basting the fish. You wind up with a very tender, not overcooked fish, and crisp skin. Flip the fish when the skin is crisp. Allow it to cook for just 30 sec – 1 min on the flesh side. Remember it will continue to cook off heat. This dish is all about texture. The crunch of the crispy skin and the creaminess of this lovely eggplant puree. 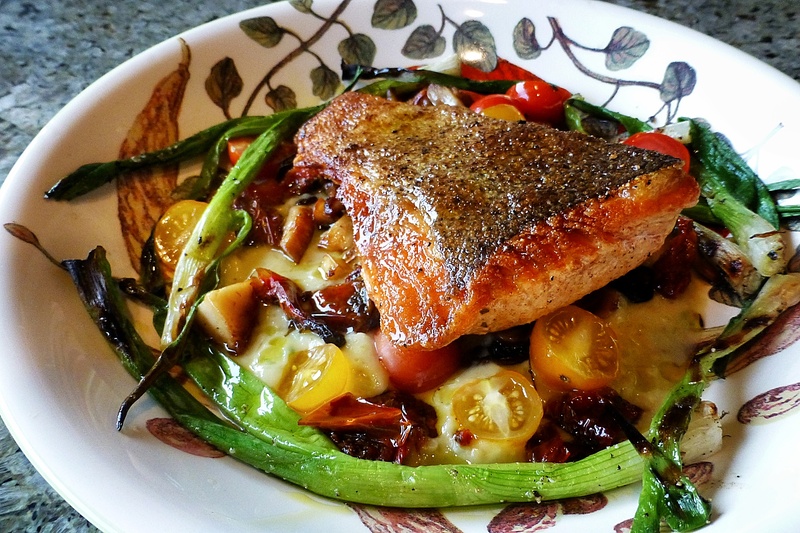 The eggplant puree goes on the base of the plate with roasted tomatoes (roast at 275F – 325F for 6-8 hours), halved fresh grape tomatoes, grilled green onions (or asparagus), and that wonderful pan seared salmon. A perfect balance of flavor… and texture. This entry was posted in What's For Dinner and tagged crispy skin, eggplant, salmon on March 5, 2015 by kritterspaw. Thanks for the tips on making crispy skin, I will try it next time. The picture looks good from my end and good enough to want to try it.